Two of the year's most anticipated films hit the multiplexes this weekend, as well as two horror films. Unfortunately for one of the horror films, there's some overlap between those two categories. Love it or hate it (or both at the same time), Facebook has become an omnipresent fact of life in modern society. Originally started as a social connection site for Harvard students, it's slowly spread outward to the rest of the world with the unstated goal of moving as much of human interaction as possible online. The Social Network purports to tell the story of Mark Zuckerberg, founder (or “founder”, depending on who you believe) of Facebook. 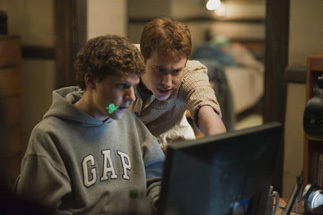 As scripted by Aaron Sorkin (who you'll likely see on Oscar night), it's a sort of very low-key techno-business-thriller, The Social Network is one of those zeitgeist films that captures the spirit of a time, which its director, David Fincher, has a particular knack for. Only in this case, he's aiming for more than just millennial malaise or disaffected 20-somethings – he's going for the whole shebang.